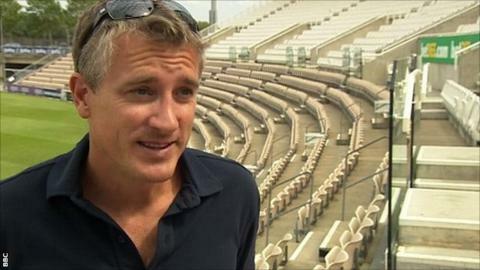 Hampshire cricket manager Giles White says the club are in no hurry to appoint a first-team coach. White was doing both roles until the end of last season, but intends to take on a director of cricket position from next summer. Hampshire began interviewing candidates last month, but White said it was important to make the right choice. "If the right person is not out there, then we will wait until he is," the 41-year-old told BBC Radio Solent. White has been manager since replacing Paul Terry in July 2008 and had guided the team to four limited-overs finals since then, winning both the FLt20 and CB40 trophies in 2012. Former Surrey director of cricket Chris Adams is among those interested in the coach role. "We've had a fair few apply," White added. "It's going through an interview process and maybe approaching a couple of people we might feel are appropriate. "It's important to get this appointment right and it's important for me to get this process right and we we won't rush into anything." Meanwhile, Hampshire have confirmed they have agreed a five-year extension to their ground naming sponsorship deal with Ageas UK. The agreement, which originally began in 2012, will now run until 2022. The ground itself is undergoing a £38.5m redevelopment to include a new four-star hotel, conferencing and hospitality facilities as well as a new media centre.